This dress waited in my queue far too long. I'm not sure what my holdup was. It has a ton of positive reviews on PR and Elizabeth's versions are amazing. In fact, I totally copied her brown version with this one. The pattern is Vogue 1027. Write that down (or click the link and order). If you do not have this pattern in your collection, you neeeed it. The dress itself is a surplice bodice with a half circle skirt, kimono sleeves and waist tie. The waist is designed to be slightly above the natural waistline, but I am high waisted, so it sits right at my waist. And it has pockets. I have recently discovered how essential pockets are in a day dress. These could be a smidgen deeper, but they hold my keys and phone admirably while I chase kids at the park. The fabric is a lovely ITY knit that came from Gorgeous Fabrics. The bodice is shaped with two pleats on each side, as well as the wrap. It is cut with the grain parallel to the wrap, which I think makes a big difference in a woven wrap in reducing the tendency of the bias to stretch out, but I don't think it makes a ton of difference in a knit. The pattern doesn't instruct you to stabilize the wrap fronts at all, although I think this would be a good idea. For this dress, I bound the front edges with self fabric, which I interfaced with Pro-Sheer Elegance to stabilize it. This helped tame the binding strips, but also prevents the wrap from stretching out. 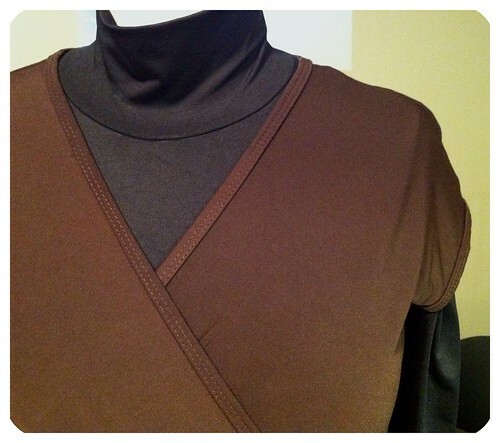 The binding really turned out nicely on the neckline. The interfacing really made a huge difference. I also bound the sleeves, but that makes them a little snug, so the next time I will do a plain hem on the coverstitch. For fit, I noted that many of the reviewers on PR felt there was excess ease in the waist particularly. I found this to be true as well. I generally cut a size 12 for my lower half, and a 10 with a large FBA for my upper half. For this dress, I cut a straight 12 and had to take in the waist 2 inches all around. It fits comfortably, but there is still about an inch of ease at the waist. I also did not remove the hem allowance on the wrap fronts when I bound them, which effectively raised the neckline 5/8 inch. The neckline is PERFECT this way. I can honestly say I have never had a wrap dress fit this well. I am thrilled. Hmm, my turnout isn't what it once was. The style of this dress reminds me strongly of the dresses my ballet instructors wore when I was a young thing. 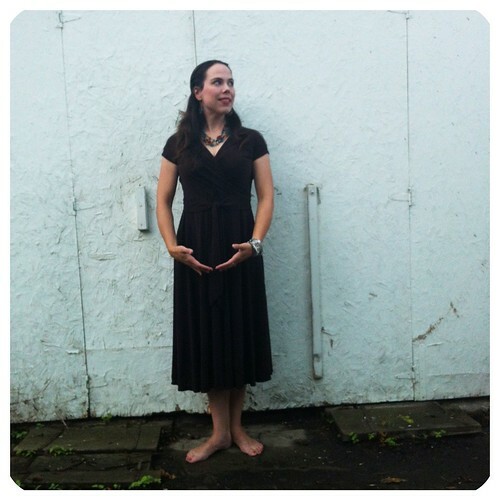 I found myself "dancing" through my day as I wore this dress. It's amazing the effect a dress that makes you feel pretty can have. I held my head higher, smiled more, and basically had a great day, despite the fact that I had a miserable head cold. I'm going to make a few more of these. 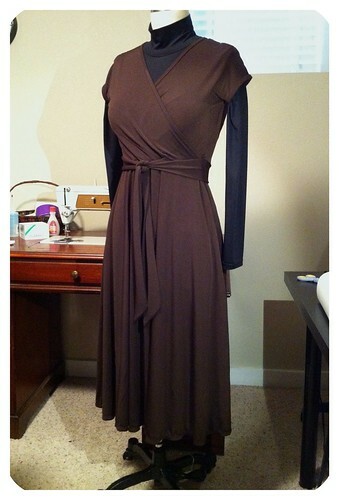 What a beautiful and versatile dress. It looks wonderful on you. I bet this will be a long term favorite. Your dress is lovely and inspirational! That's a fabulous dress, and one you can wear on into fall. Fall--it isn't that far away! It's gorgeous! I love how you look completely put together, and yet, I'm sure that dress is incredibly comfortable. Oh! Thanks for the heads up! I'm going to hop on over and purchase it today! I am thinking that it might work well for us zaftig figures, also. I shall definitely check this pattern out. And, yes -- is not "Gorgeous Fabrics" aptly named??? The ensemble wants only a pair of classic Chanel ballerina flats in ivory kid, with chocolate patent toe. You should run right out and get some. Go ahead. I'll wait. Love this dress! It suits you well, very prettyy. BMV has a sale...oops, it just fell into my cart! I love your dress and it is something I have been meaning to make up for myself one day. 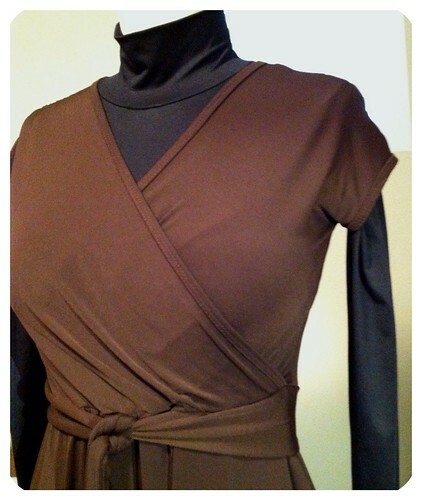 Thanks for the tips about the neckline SA's , the interfacing of the bias binding and the ease in the waist. Great dress! I love how secure the wrap looks, and your binding is absolutely perfect! Great dress. The color looks darker on you than on your mannequin. I think it would be superb on you in red and pink, also. 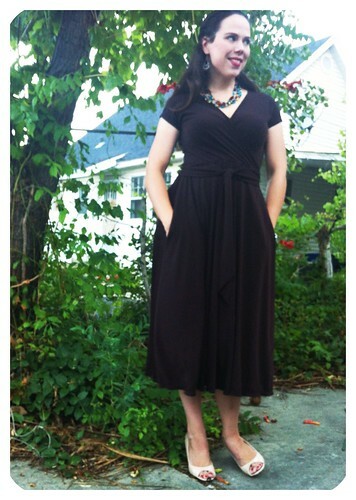 i made this dress a few months ago; it is fabulous, no? i did a FBA and rotated the dart into the two pleats. i LOVE the pockets. i definitely need to make it again. You look lovely and graceful in your newest dress! I will have to pull out this pattern and make it again. It looks so lovely on you! And yes, totally a flashback to ballet =) But really it's quite amazing. Thanks for the shout out. It's my favorite dress pattern for sure--toss it on, throw on a random accessory, and you look like a million bucks in like 1 minute. How have I missed that it has pockets? I will have to revisit it indeed. Your binding is beautiful too! This is gorgeous on you! And your coverstitched binding looks so professional. I have this pattern but feared it would make me look too hip-y (as opposed to hippie), but you are making me think I should give it a try. Beautiful dress. Very flattering on you. I think you've convinced me to try this pattern. This looks great on you! It makes the most of your lovely figure. You did such a neat construction job on the stretchy fabric too! That really is a great looking dress! I am always a sucker for a good wrap dress and I'd love to give this one a try! It really does flatter you, Kate. I love this pattern. Yours is beautiful! I'm glad you finally got around to making it!